The 1948 curved house and the surrounding site to the title boundaries. The house is historically, aesthetically, architecturally and technically significant to the Shire of Nillumbik. The house is historically significant as one of the first buildings to be constructed to the north of the Eltham township and one of the first mud brick buildings constructed in Eltham after the Council's acceptance of mud brick as a building material (Criteria A & B). The modest size of the house is characteristic of homes constructed in Eltham immediately after World War II (Criteria A & D). The building is architecturally and historically significant as a work by the prominent 'Eltham-style' architect, Alistair Knox and for its connections to the local builder Horrie Judd and Sonia Skipper (the daughter of the novelist Mervyn Skipper) (Criterion H). The Periwinkle house is architecturally and technically significant because it contains a number of particularly innovative features - it was the first time that Knox had employed a curved wall and was one of the first curved post-war houses to be erected in Melbourne, it was also one of the first houses to feature a concrete slab floor. 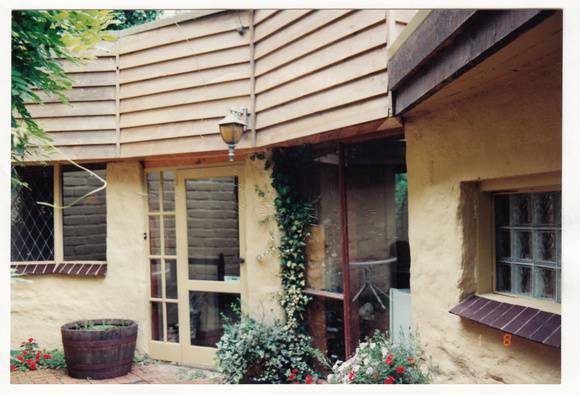 The techniques employed during the construction of the Periwinkle House went on to have an important influence on the development of Eltham's distinctive residential character (Criteria A, E & F). Walls single skin solid mud brick. Roof lean-to with eaves, originally gravel topped bitumen sheet over timber board lining. Features are the curved shape, lean-to roofs and the otherwise simple detailing.